Willis Group and Towers Watson have taken out a spot of insurance against future troubles in the sectors they serve. Willis, an Irish-domiciled broker big in the United States and the UK, is joining forces with Towers Watson, a U.S.-based risk and healthcare consultancy. The tie-up has a defensive logic, but carries positive rationale as well. Insurers are battling historically low interest rates, while reinsurance premiums are at the low end of their long-term ranges. Neither Willis nor Towers Watson appear to be struggling at present – the former did see net income fall 0.8 percent between 2013 and 2014, but the latter saw it rise 13 percent. Still, the more reinsurers like PartnerRe do their own mergers, the less will be left for broking and consultancy fees. The promise of over $100 million of annual cost synergies in a Willis-Towers deal will help maintain returns. But there’s also a chance to drive up revenue. Towers Watson is big in healthcare consultancy – advising companies on how their employees should arrange their medical and pension affairs. Post-Obamacare, this sector should become busier. Hooking up with Willis, which already has strong broking and consulting relationships amongst middle-sized corporates, could introduce these services to new markets. So-called “mergers of equals” usually aren’t. Yet Willis Towers Watson, as the new group will slightly inelegantly be called, has a reasonable division of spoils. Each firm gets six board directors, Willis the chairmanship and Towers Watson the chief executive role. Willis shareholders get 50.1 percent of the new group, Towers 49.9 percent, plus a one-off $4.87-a-share dividend. That said, the June 29 share prices would imply that Towers investors might have received 54 percent of the combined $18.1 billion group – a bigger gap than appears to be bridged by the special dividend. 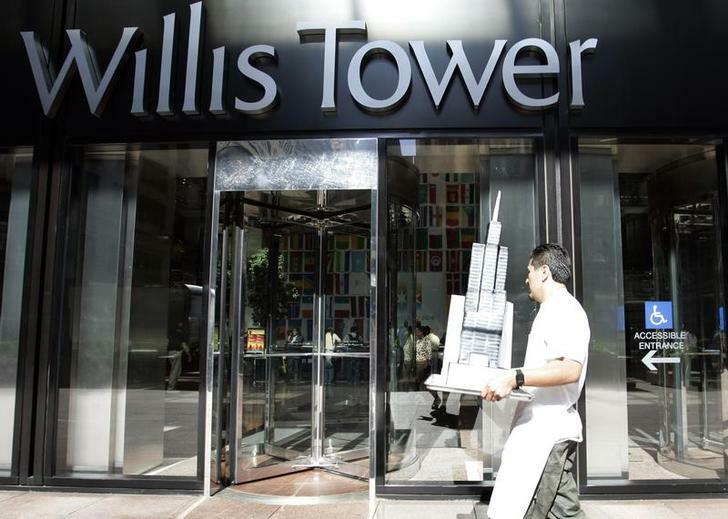 A 5 percent rise in Towers’ shares and a 7 percent drop in Willis’ since March suggest one reason for the disparity. Another might be Towers’ keenness to redomicile away from its American base and start taking advantage of Willis’ low Irish corporate tax rate. Dagoberto Morales, of Sarah's Pastries and Candies, delivers a cake shaped as the Willis Tower before a dedication ceremony at the Willis Tower in Chicago, Illinois. Willis Group and Towers Watson announced on June 30 a merger that will value the two companies at $18 billion. The Irish-domiciled insurance broker and the U.S.-based consultancy group will form a new company, Willis Towers Watson, domiciled in Ireland. Towers Watson shareholders will receive 2.649 Willis shares for each Towers Watson share they own, plus a one-off $4.87-per-share cash dividend. Willis shareholders will own 50.1 percent of the combined entity, while Towers Watson will own 49.9 percent. Towers Watson Chairman and Chief Executive John Haley will become chief executive of the combined company, Willis Chief Executive Dominic Casserley will be deputy chief executive, and Willis Chairman James McCann will chair the combined group. The combined group expects to generate run-rate cost synergies of $100-$125 million fully realised within three years post-close.